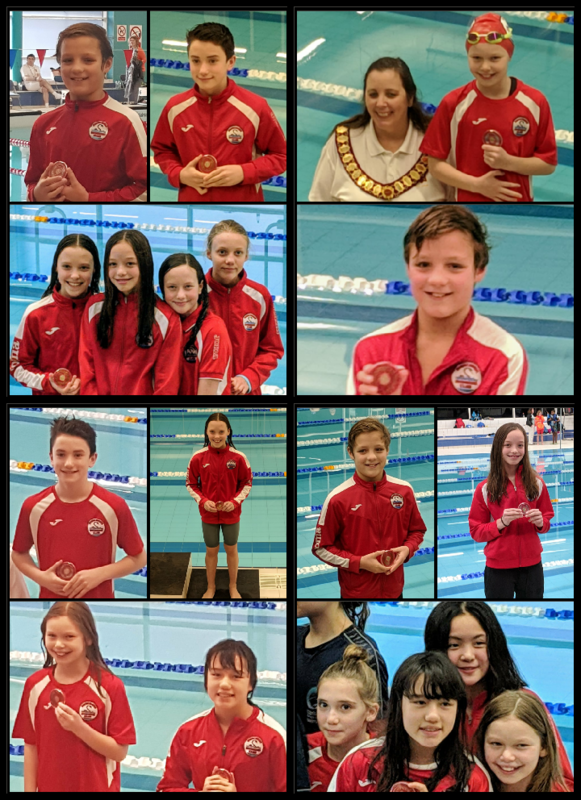 Week 2 of this year’s County Champs saw Anaconda age group swimmers carry on their fine form by gaining personal bests aplenty, qualifying for 20 Finals, coming away with 12 medals and plenty of positives from another very successful County Champs for the club. The weekend kicked off with the relays and the girls showed strength in depth by fielding teams in all age groups. The 10/11 year girls squad of Seren Millar, Iris Court, Lily Arvanitis and Iris Brodie finished in 7th place in the 4×50 medley relay with a time of 2:43.48 and the girls finished 12th with 2:28.29 in the 4x50m free relay when Vita Braden replaced Iris Court. The 12yrs squad of Stephanie Skoplakis, Helena Flynn, Rose Lin and Ella Banks bagged a Bronze medal in the 4×50 medley relay with a time of 2:27.60 and finished 6th in the 4×50 free relay with 2:14.20. Not to be outdone, the 13yrs squad of Mabel Hayes, Sophia Bremen, Annabel Dewhurst and Lily Waite also claimed a Bronze medal each in the 4x50m medley relay with a time of 2:15.64. Unfortunately the girls suffered a disqualification in the 4×50 free relay. Asa Williams (11) had another busy and successful weekend taking part in 9 events, reaching 7 finals and winning 3 medals. Asa struck Gold in the 50m backstroke after qualifying for the final with a personal best of 36.90 he went on to smash that in the final with 35.60. A silver medal was the reward in the 100m backstroke after again hitting a PB in the heats with 1:19.35 and then smashing that in the final with 1:17.40 to finish 2nd. Asa finished his trio of medals with a Bronze in the 50m butterfly and yes you guessed it,he hit PBs in both the heats (35.87) and final (35.31). Rocco Giustiniani (12) was crowned county champion in the 50m fly hitting a new PB time 32.41 after a 32.74 in his heat. He then went onto claim the Silver medal in the 100m fly with another PB 1:12.49. Rocco also qualified for the 100m breaststroke final with a PB time of 1:31.92 and his ime of 1:32.5 placed him 6th. PBs were also achieved in the 100m IM (1:20.83/10th) and 200 IM (2:52.69/5th). Helena Flynn (12) also hit Gold, in the 100m breaststroke final after qualifying fastest with a PB time of 1:30.18 and then went onto smash that time with 1:28.7 in the final. Helena also claimed a Silver medal in the 50m breaststroke final with 41.21 to make it a full set of medals after her Bronze in the 200m breaststroke on the first weekend of counties. Lily Waite (13) won herself a Silver medal in the 50m fly with a new PB time of 31.18. Lily also hit PBs in the 100m free (1:07.7/10th) and 200IM (2:46.94/10th) to complete her successful weekend. Mabel Hayes (13) had a great weekend hitting PBs in all 8 of her events and won a Bronze medal in the 200IM with 2:40.18. Mabel also qualified for the following Finals achieving PBs in both heats and Finals, 50m Free (29.47/4th) 50m breaststroke (37.90/4th) 100m free (1:05.01/6th) 100m breaststroke (1:25.14/6th). New PBs were also achieved in the 200m backstroke (2:38.64/7th) 100m backstroke (1:14.87/9th) and 50m fly (33.04/9th). Stephanie Skoplakis (12) completed our medal winners with a Bronze in the 100m breaststroke when again an Anaconda swimmer showed great racing skills when Stephanie qualified for the final with a PB time of 1:31.04 and then went on to improve in the final when 1:30.56 placed her in 3rd to share the podium with Gold medal winner Helena. Anaconda were also represented in finals by Chloe Baduna (13) in the 50m breaststroke (38.66/6th) and the 100m breaststroke (1:24.61/5th) and Annabel Dewhurst (13) in the 50m breaststroke (39.11/7th). The squad was completed by Lily Arvanitis (11) Iris Court (11), Iris Brodie (11), Rose Lin (12), Sophia Bremen (13), Finn Larner (11), Alex Mahon (12), Alec Selwyn (13) and Taran Thomas (13) who all swam exceptionally well and posted new PBs at this high level meet. 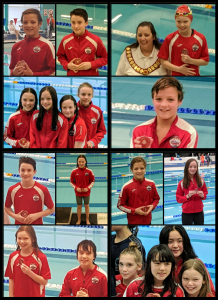 The club received an email from Erol Baduna, father of Chloe, who said of the swimmers representing Anaconda SC ” I have to admit for such a small group of swimmers (compared to far larger clubs) who attended the age group counties over the past few weekends, how impressed I was with not only the attitude but achievements by all. From those who achieved fantastic medals to those who only attended the relays/single races (having to wait hours patiently) achieving amazing PB’s. The way everyone supported each other when things went wrong, broken googles just before getting on the blocks to comforting those who maybe did not do so well. To every swimmer who stepped up on to those blocks for Anaconda at counties, well done, you should be very proud of yourselves!